However, it is not known whether the hypsilophodonts were a clad or a series of branches from a lineage leading from near Heterodontosaurus to the iguanodonts. There is now a general concensus that the iguanodonts are not a clade. That is, the traditional family of iguanodonts are indeed a series of intermediates between more basal ornithopods and the Hadrosauridae. The final flowering of the ornithopods, at the end of the Mesozoic were the specialized hadrosaurs of the Lambeosaurinae, with huge, elaborate nasal crests that may have acted as resonating chambers. We cannot see or hear them now, but it is impressive even to imagine a herd of Parasaurolophus on the move, hooves pounding the ground, blasting ear-splitting, braying calls -- an unstoppable brass and tympani crescendo like the Dies Irae from Verdi's Requiem. ATW020419. The hypsilophodonts are a paraphyletic assemblage of mostly small and lightly built, fairly primitive, ornithopods These small active bipedal animals were clearly the dinosaurian equivalent of small ungulate mammals like deer and gazelles. In many current dinosaur cladograms, the term Hypsilophodontidae, referring to a sister taxon to the Iguanodontia, is now discarded as these animals are believed to be a paraphyletic succession (like "Pelycosauria"), rather than a clade in themselves. While I agree that hypsilophodonts are the most plausible ancestors of the Iguanodontia, I am not happy with the current phylogeny, as it ignores too much of the evidence of fossil record. In the evolutionary sequence Hypsilophodon - Dryosaurus - Camptosaurus - Iguanodon, the hypsilophodontids gave rise very early to the dryosaurs, perhaps only a few million years after evolving (both groups appeared in the middle or late Jurassic). Rather than the numerous ghost lineages implied in the currently popular cladogram of early ornithopod relationships, it is more likely there were a few groups, evolving alongside each other. However, details of hypsilophodont evolutionary relationships will have to await more and better fossils. As well as typically small forms there were also unusual and specialized larger types. Tenontosaurus is sometimes considered a basal iguanodontian; Muttaburrasaurus is variously considered a basal iguanodontian, a specialized hypsilophodont, camptosaurid, or an iguanodontid. Both were large (around 6 meters) middle Cretaceous animals. Personally I think it is more reasonable to assume that a lot of the supposedly advanced iguanodontian features of these two genera are simply a result of adaptation to larger size, more efficient food-processing, etc. After all, the original iguanodontians appeared some fifty million years earlier at least, in the form of Late or even Middle Jurassic dryosaurs and camptosaurs. It is implausible that these larger hypsilophodonts should continue invisible for millions of years, suddenly appearing fully formed in the mid Cretaceous like Athena from the forehead of Zeus. What may be more likely is that they were side branches of one or more contemporary hypsilophodontid lineages already known from fossils. In any case, there is no doubt that a number of ornithopod types were evolving alongside each other and in parallel during the late Jurassic and throughout the Cretaceous. Thus Thescelosaurus, one of the last ornithopods, is also one of the most primitive, a living fossil continuing alongside more advanced forms. MAK011118. The single most important group of middle to late Mesozoic terrestrial herbivores, the Ornithopods include a diverse range of small to very large generalised mostly bipedal herbivores, almost all of anywhere from the Late Jurassic to Late Cretaceous periods, and ranging in size from less than a meter to over fourteen metres in length. At one time they were considered the ancestral types from which the other lines of Ornithischia developed. MAK010112. Broadly speaking, there are three recognizable types. The Hypsilophodontidae were very small, as dinosaurs go, with almost parrot-like beaks and a distinctly bipedal stance. Some workers believe that the Marginocephalia are directly derived from this group. The Iguanodontidae are traditionally the transitional forms: much bigger than the hypsilophodonts, with elongated snouts and narrow tooth rows. "True" iguanodonts posess an unusual thumb-spike. In a cladistic sense, the Iguanodontia are rather hard to define. However, they certainly include the final group, the Hadrosauridae. Perhaps the hadrosaurids' most salient characteristic is the dental battery, with multiple generations of teeth all working simultaneously to form a remarkably effective food processing apparatus. ATW020420. Genasauria: Thyreophora + * : Ornithopoda + Marginocephalia. <6 premaxillary teeth; substantial diastema; asymmetrical enamel on teeth of both upper and lower jaws; absence of supra-acetabular buttress. Links: DinoData: Cerapoda; ornithischia; Lectures 17 and 18 - Late Jurassic: Morisson, Tendaguru; Basal Ornithischia. Note: This clade may be synonymous with Ornithopoda, or even Genasauria. The record of Triassic ornithischians is very sparse, and the major ornithischian groups clearly radiated from rather similar basal stock in that period. In particular, it is quite possible that the marginocephalians derived from an early hypsilophodont or perhaps a heterodontosaur. The idea that even Thyreophora derived from ornithopods is discussed by Conrad 2000). This position is less widely held, but cannot be entirely excluded. ATW010327. Cerapoda: Marginocephalia + * : Heterodontosauridae + (Hypsilophodontidae + Iguanodontia). Premaxillary tooth row offset ventrally compared to maxillary; jaw joint well below level of tooth rows by ventral extension of quadrate. Ornithopoda: Hypsilophodontidae + Iguanodontia) + *. Small (1-2m, <20 kg); high-crowned cheek teeth with chisel-shaped crowns; denticles on distal 1/3rd of cheek teeth; large, caniniform teeth on premaxillae & dentary; small tusks perhaps restricted to males; teeth absent from tips of jaws (probable beak); enamel thickened on labial side of upper teeth & lingual side of lowers; neck short; ossified tendons on last dorsal, but not caudal vertebrae; tail long; powerful arms with possible digging ability; tibia & fibula fused; forelimbs markedly smaller than hindlimbs; astragalus & calcaneum likewise fused to crus; horizontal posture, but bipedal; may have dug for food. Note: This group may also contain Echinodon (Late Jurassic of Europe). Image: originally after In Hand Museum (former site), with osteology corrected and some details altered per Smith (1997). Links: DinoData: Heterodontosauridae; Heterodontosaurus; Heterodontasaurus Tucki; Heterodontosaurus - Enchanted Learning Software; ornithischia; Untitled Document; Heterodontosauridae Dutch); The Natural History Museum's Dino Directory; Heterodontosauridae; Mikko's phylogeny); DINOSAURS- Family Heterodontosauridae (brief discussion); Dinosaurs-Exam 3 Notes AKA- Adrian's Uber-Notes; HETERODONTOSAURIDS; Heterodontasaurus Tucki; Ornithischia. References: Galton 1986); Smith 1997); Weishampel 1984). ATW030426. Hypsilophodontidae: Hypsilophodon. Hypsilophodon > Iguanodon ? Range: Middle Jurassic to Late Cretaceous of Europe, North America, Australia, China, & Antarctica. 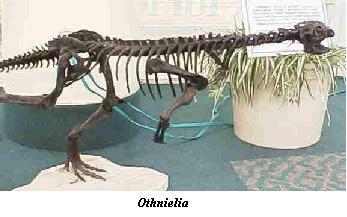 Ornithopoda:: Iguanodontia + * : Leaellynasaura + Thescelosaurus + (Zephyrosaurinae + Othnieliinae + Hypsilophodontinae)). 1-4 m bipedal herbivores. $ cingulum on dentary teeth; teeth present on premaxilla which may have also sheared against dentary teeth; broad, chisel-shaped teeth; continuous, if uneven occlusal surface; premaxillary tooth row (when present) below maxillary tooth row; also horn beak for cropping; subnarial ramus of premaxilla contacts prefrontal or lacrimal; maxilla rotates on peg & socket within premaxilla (pleurokinesis); highly mobile jaw allowed upper jaw to rotate out – shearing; fused parietals form medial crest; mandibular condyle below level of cheek teeth (long quadrates); $ small quadratojugal; crescentic paroccipital processes; $ sternal portion of ant ribs ossified; long tail with tendons partially ossified; tail with hypaxial (as well as epaxial) tendons; scapula shorter than humerus; long forelimbs, grasping (not running) hands; manus 2-3-4-?3-?1; $ pre-pubic process extends upward toward tip of ilium & is rod-like, wider than deep; obturator process on ischium; tibia < femur (fast biped? ); long, robust cursorial legs; pes 2-3-4-5-0. Embryos found with well-formed joint surfaces (mobile & less parental care?). Links: DinoData: Hypsilophodontidae; Lecture 14 - Late Jurassic: Morrison, Tendaguru; Willo: the Dinosaur with a Heart - Fast Facts; Zephrosaurus schaffi; Hypsilophodon - Dinosaur - Enchanted Learning Software; Dann's Dinosaur Info: LEAELLYNASAURA; Dinosaurier.org / Saurier-Web.de Forschungsnachrichten German); CLADOGRAMS; DinosauriaN UNGULATES; Biology 356; DINOBASE, Sibbick's dinosaur pictures; Pretty Butte Paleontology- Catalog of Hypsiliphodontidae Fossils nice images of bits and pieces); Saurier-Web.de Forschungsnachrichten German: discovery of a comparatively huge hypsie, Tenontosaurus. We classify Tenontosaurus as a basal iguanodont. The difference is largely one of nomenclature -- see Note below); Paleontologia - GEOMODEL There's a reason the Rennaissance began in Italy...); Dinosaurs-Exam 3 Notes AKA- Adrian's Uber-Notes. Image: (reconstruction) Zephyrosaurus; skull and jaw elements) Dinosaurs-Exam 3 Notes AKA- Adrian's Uber-Notes. Note: There is continuing doubt about the status of this taxon, some arguing that hypsilophodonts are a series of stem Iguanodonts. The difference really depends more on exactly how the Hypsilophodontidae are defined. Phylogeny: Hypsilophodontidae: Thescelosaurus + (Zephyrosaurinae + (Othnieliinae + Hypsilophodontinae)) + *. Comments: The best known of all the small Australian hypsilophodonts. Distinctive ridges on the unworn maxillary teeth different from those of the contemporary Atlascopcosaurus. The femur shows some primitive fabrosaur-like features. The eyes are very large, and the brain cavity shows an enlarged optic lobe, suggesting nocturnal vision. This animal lived in a polar environment, and hence needed to see during the long periods of darkness. If so, it was quite likely to have been endothermic (warm-blooded) as well. Even if the Antarctic climate was not as severe as it is today, the temperature still frequently dropped below freezing, and it is difficult to see how a small cold-blooded animal could remain active in such an environment. As with many of these animals, the incomplete nature of the material means that Leaellynasaura's evolutionary relationships are unclear. It seems to have some similarities to the zephyrosaurines or possibly the Othnieliinae ( Thescelosaurus! ). Others place it with Othnielia and Zephyrosaurus in an unnamed new family. MAK011118. Late Cretaceous (Campanian to Maastrichtian) of North America. Hypsilophodontidae: Leaellynasaura + (Zephyrosaurinae + (Othnieliinae + Hypsilophodontinae)) + *. Comments: one of the last of the dinosaurs, a contemporary of the great Tyrannosaurus and Triceratops, this animal was apparently very primitive by ornithopod standards. It was more heavily-built and stouter of limb then most hypsilophodonts, and probably, like its bigger cousins Tenontosaurus and Muttaburrasaurus, or even a small iguanodontid, and capable of getting about on all fours. Features distinguishing it from other hypsilophodonts are the presence of premaxillary (front upper jaw) teeth and five toes per foot. Its femur and tibia were of equal length, indicating a not very fast moving animal. There seem to have been bony studs or osteoderms along the back, perhaps to compensate for lack of fleetness of foot. It is a strange fact that such a primitive and seemingly clumsy animal was able to flourish at the very end of the age of dinosaurs, at a time when many more specialized forms had already been driven into extinction. Perhaps its very primitiveness and generalized adaptations helped it in this regard. Thescelosaurus and its close cousin Bugenasaura must have had immediate ancestors living during the late Jurassic and the Cretaceous, but none have been found as yet. MAK011118. 3-4 m; small head; beak; premaxillary teeth; orbits large; fairly massive, low slung body; long, pointed tail; short arms; 5 fingers; rod-like prepubic process; tibia shorter than femur; 4 toes. Image: from www.dinoheart.org, substantially modified. ATW010730. Phylogeny: Hypsilophodontidae:: Othnieliinae + Hypsilophodontinae) + *. Although apparently less specialized than the Othnieliinae, these animals lived later (in the Cretaceous rather than the Jurassic period). One may wonder about the phylogenetic analysis, especially in view of the fairly scanty material available. They are distinguished by specialized skull characters, such as a bony boss or expansion on the jugal (cheek-bone), which means they are probably a monophyletic side-branch from the main line of ornithopod evolution. These were fast running animals. Introduction: A group of small Jurassic hypsilophodonts. As with others of the clan, the legs and tail are long, the body lightly built, and the forearms short. The teeth however are distinctive, being proportionally smaller, and completely covered in enamel (rather than only on the grinding surfaces). This may have indicated a tougher more abrasive food source. Comments: Presumably a relative or descendent of Othnielia rex, this little dinosaur is probably not different enough to deserve a new generic name. It had long spreading toes, indicating that it lived in swampy terrain. This small animal lived after the extinction of the Jurassic megafauna. MAK011118. Image: by Michael Corriss, reproduced by permission. Links: DinoData Dinosaurs O059 OTHNIELIA; Utahraptor and Othnielia Photos; Othnielia - Dinosaur - Enchanted Learning Software; OTHNIELIA; Othnielia; Othnielia; EXPO 2002; BBC - Walking with Dinosaurs - Fact Files; 無題 標準ページ. ATW031008. Phylogeny: Hypsilophodontidae::: Othnieliinae + *. Remains: Two nearly complete skeletons with skull. Comments: A number of partial and complete skeletons, mostly juveniles. It was at one time believed that this animal was arboreal, and there is a famous painting by Neave Parker showing it perched on a large branch. It was later realized that this was a purely ground living, active cursorial running) animal. MAK. Remains: incomplete skeleton and skull. Comments: A late, advanced form, with a distinctive skull. More advanced than Hypsilophodon in some features, while more primitive in some features of the skull. The large eyes indicate well developed vision, possibly nocturnal or in dim light. Like other hypsilophodonts, this animal probably foraged among the forest undergrowth. MAK. Links: DinoData Dinosaurs H064 HYPSILOPHODON; DinoData Dinosaurs P040 PARKOSAURUS; Paleontology and Geology Glossary- Y; YANDUSAURUS; Yandusaurus hongheensis; Hypsilophodon - Dinosaur - Enchanted Learning Software; DinoWight- Hypsilophodon, an Isle of Wight Hypsilophodontid; Eotyrannus attacking Hypsilophodon; FPDM - Hypsilophodon foxii; HYPSILOPHODON.